New York City is a global mecca when it comes to shopping. As the fashion capital of the USA, it offers you a vast array of stores where you can easily spend the entire day swiping your credit card. After you’ve shopped until you’ve dropped, take a rest and get ready to see what else NYC has to offer! But with a city so vast, where do you start? Take a breath and relax because we did the dirty work for you. Pastrami is an inherent part of New York City. Its devotion is this cured meat sometimes rivals NYC’s brunch culture. Even if you’re not a carnivore, visiting one of New York’s infamous delicatessen is a must. Some of our favorites include Katz’s Deli and Sarge’s. Sometimes you just got to let loose and dance the night away. If live music makes your heart sing, Rockwood Music Hall is the place to go. Located in the East Village, this hotspot offers everything your dancing shoes could desire. If navigating a crowded museum on Friday night isn’t your idea of fun, check out the Whitney, where you can enjoy and relish contemporary art on Friday evenings. Once you made rounds, grab a bite at Untitled, the museum’s restaurant. 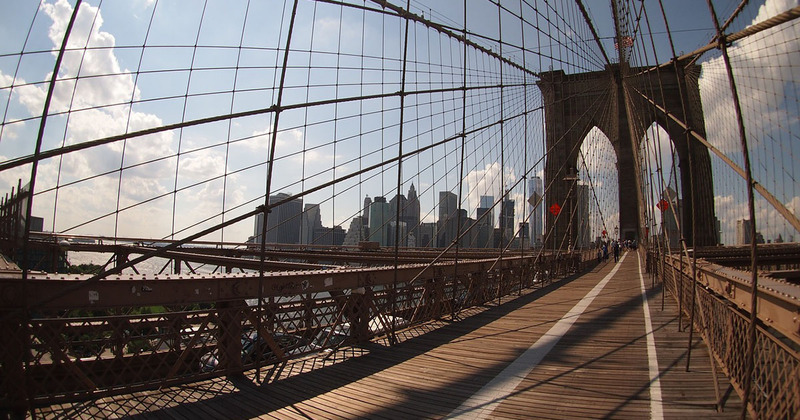 Just one look and you’ll see why so many people post pictures of themselves on the Brooklyn Bridge. It’s one of the top tourist attractions in New York. As you make your way across, the view from the top is nothing short of amazing. If possible, make the tourist trek at night, and you will be privy to seeing downtown Manhattan all aglow. If your inner yogi needs a boost, imagine yourself doing your best down dog in complete darkness while hip-hop blares overhead. Y7 is the place where all of your yogi dreams can come to life. And for only $22 a session, it’s the perfect place to get fit without falling asleep out of boredom. Rainy days in the city don’t have to be a washout. Head over to Ace Bar or Fat Cat where you can drink beer and play arcade games until the sun comes out again. Once you visit Strand, you’ll never be the same. Home to over 18 miles of new and used books, you can enrich your mind without emptying your pockets in this quaint book nook. In between rooftop drinks and late-night diner runs, the locals also find time for customary morning bagel runs. Sitting on our list of favorites are Tal’s and Tompkin’s Square Bagels. If you’ve always wanted to play shuffleboard but the thought of going on a boat makes you seasick, you’re in luck. Gowanus Canal is home to some of the best shuffleboard games in town. Striped cabanas and palm trees set the stage while DJ sets keep your motivation high! Chelsea Piers indoor rock climbing wall is cheap, fun and open seven days a week. Scaling this user-friendly wall is challenging, but with $25 instructor-led session, it’s worth every penny. Tourists aren’t the only ones who go gaga over New York’s skyline views. Native New Yorkers will attest that nothing compares to a cold cocktail on a rooftop. Sure, the cocktail might be mediocre, but the swoon-worthy capture for your next Instagram post will be worth it. Sure, your rendition of “Hit Me Baby One More Time” isn’t the best, but who cares? Head over to Gagopa where you can croon with the best of them until the wee hours of the morning. Who says you can’t find good eats in Flushing? If you’re craving dumplings, White Bar in Flushing is about to become your new best friend. Order the wontons in chili oil. Your taste buds will thank you. It’s true: New Yorkers love brunch. It’s the only socially acceptable time to get drunk before noon. But do you really want to sit curbside in silence? Hop over to Lips for their Broadway Brunch and get ready for the brunch of a lifetime. If you believe shopping and eating go hand in hand, hop the metro and spend the at Long Island City’s Flea and Food Market. Not only is it a frequent filming spot for HGTV, but you’re bound to find bargains galore. Did you know that only $20 bucks you can watch the Nets or Islanders game? Skip the expensive seats and head on over to Barclay’s for a rousing hockey game. Sure, long lines, noisy people and trying not to be impaled by a selfie stick is annoying. But once you make it to the top, those minor annoyances are soon forgotten. The view from WTC, which happens to be the tallest building in the Western Hemisphere, will leave you in awe. New York is home to more than a handful of food courts, meaning you can literally find something to eat on every corner. But if you want to spend the day sampling everything under one roof, head over to Dekalb Market where you can taste everything from pierogis to cake pops. If your hotel doesn’t come equipped with a rooftop pool, you can still cool off after a long day of sightseeing. Dream Hotel and McCarren Hotel offer day passes where you and lounge poolside. If you’re on a budget, head over to Astoria Pool Park where you can take a dip for free. No visit to the Big Apple would be complete without paying homage to Lady Liberty. Although the line for the ferry in Battery Park is usually long, if you arrive early, you can avoid it for the most part. The Statue of Liberty is magnificent to see up close, but if you want more bang for your buck, head over to Ellis Island where you can learn about the immigrants who helped to make NYC what it is today. This historical landmark ties with Lady Liberty as one of the top tourist attractions in the New York City. The view from the top is breathtaking, as is art deco interior. Be sure to arrive early to avoid long lines. Head down to Wall Street where you can pose with the Charging Bull. Following this, why not take a peek at the New York Stock Exchange? Rest assured, there is nothing quite like watching these money moguls wage war against each other. Manhattan isn’t the only borough worth exploring. Take the ferry to Red Hook and spend the day boutique shopping on Van Brunt Street or play a rousing game of miniature golf at the Brooklyn Crab. Why pay through the nose for beverages when you can head to Astoria and chug brew? Bohemian Hall and Beer Garden offer a variety of brews for only $16 a pitcher, which leaves you enough to order authentic brats hot off the grill. You love basketball but not the exuberant prices you usually have to pay to sit in a chair. If you really want to see the Knicks, catch a game at MSG. You can score tickets for about $50, which leaves you plenty of cash for beers and snacks. Learn how to make this perfectly layered work of art in downtown Williamsburg. Momofuku cakes turn scraps into delicious masterpieces you can savor on the subway ride back into the city. Sightseeing takes a lot out of you, so why not kick back and relax in style? Nitehawk Cinema is the place where you can nosh on moviehouse delicacies while sipping a signature cocktail. Comic book collectors unite! Nestled in Union Square, Forbidden Planet is where you want to go for all of your comic books needs, wants and everything in between. It’s also up the block from Strand. Summer nights are best spent riding a Ferris wheel while eating cotton candy. The thing is, you need to go to Coney Island to do it. Hop on the metro and in about one hour, you’ll find yourself in this quaint beach town.